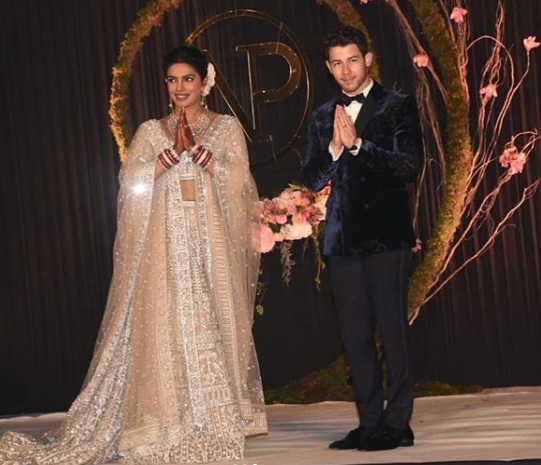 PM Modi attends and congratulates newly wedded couple Priyanka Chopra and Nick Jonas at their wedding reception at the Taj Mahal Palace hotel in Delhi on December 4. 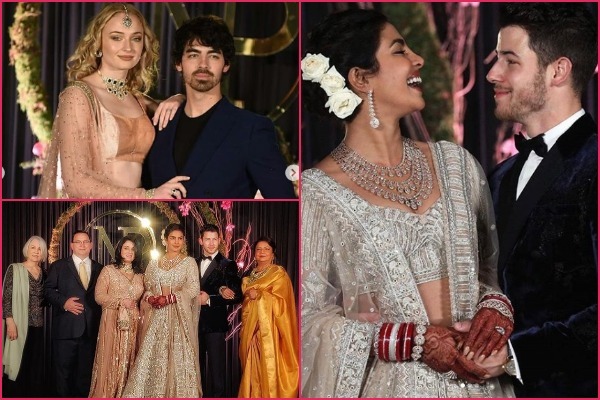 The first wedding reception by the newly married Jonas couple was only for politicians, business tycoons and fashion designers. 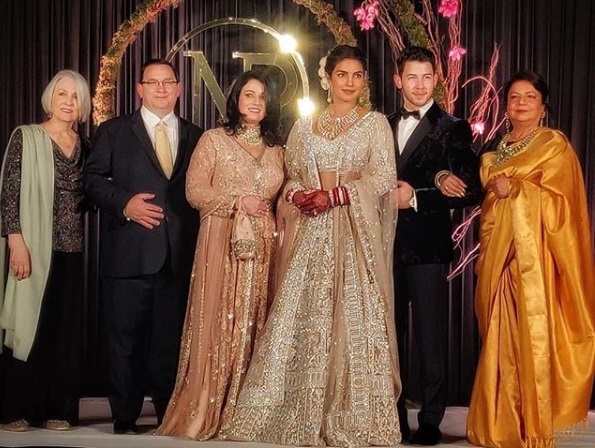 After tying the knot in an extravagant wedding affair on Dec 1 and Dec 2 at the Taj Umaid Bhawan in Rajasthan, Priyanka and Nick along with their closest family members hosted their first wedding reception party in Delhi on Tuesday. 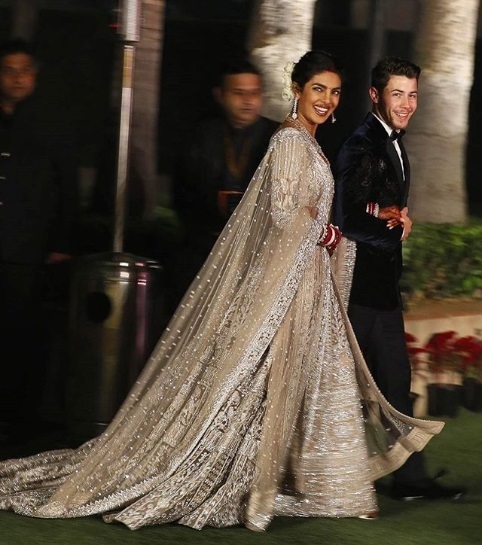 Priyanka wore a silver sequined Falguni Shane Peacock lehenga for her reception party in capital. She accessorized it with sparkling layered diamond necklace, dangling earrings and assortment of white rose in her side hair bun. She absolutely makes a wonderful bride with heena stained hands, red chura and that happy smile. The 26-year-old singer Nick looked elegant in velvet blue tuxedo. 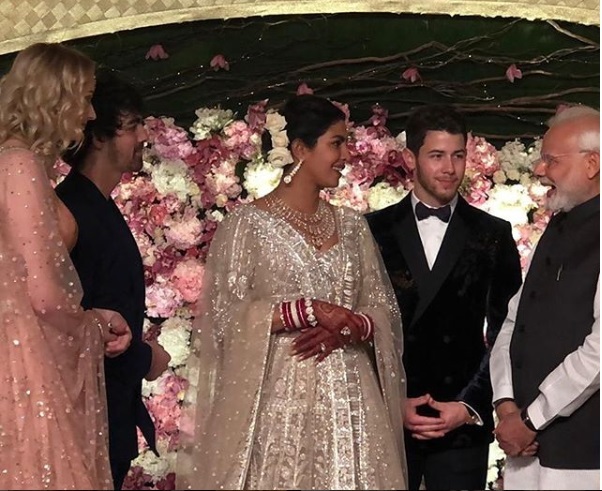 Talking about the guests at Nickyanka reception, Prime Minister Narendra Modi was in attendance to congratulate global icon Priyanka and ‘Jealous’ singer Nick Jonas. 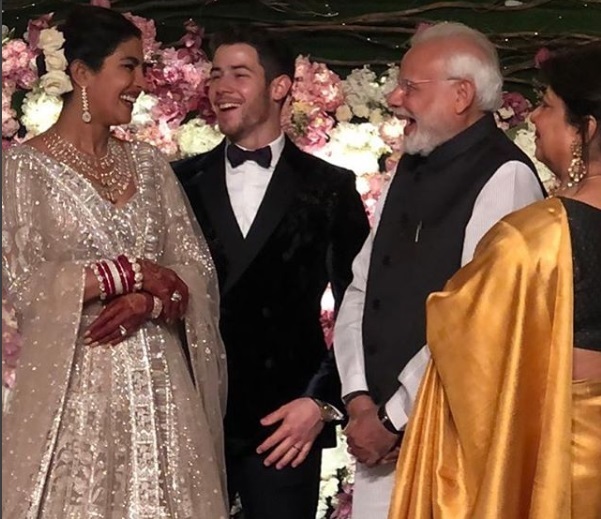 Modi was clicked along with newly wed couple and their family. 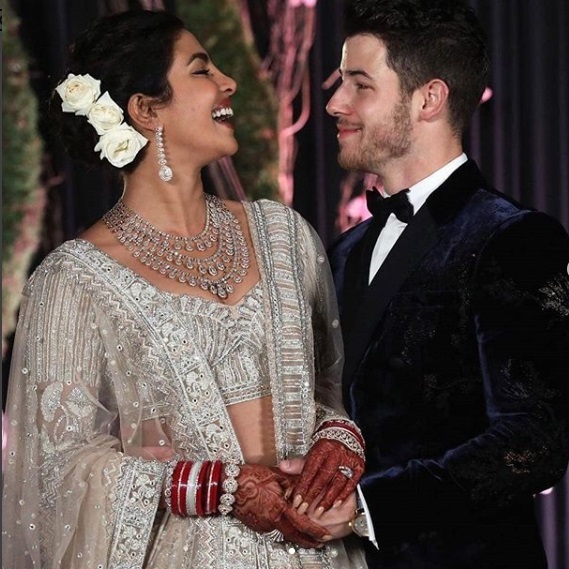 While Nick has already bowled us with his Indian outfit attires, there is this another couple who is rocking in Indian outfits with panache. 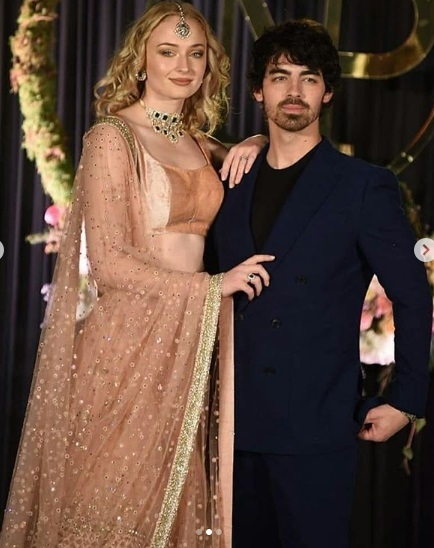 We are talking about very popular Sansa Stark of GoT, Sophie Turner who is total stunner and grabbing international headlines for her traditional Indian looks. 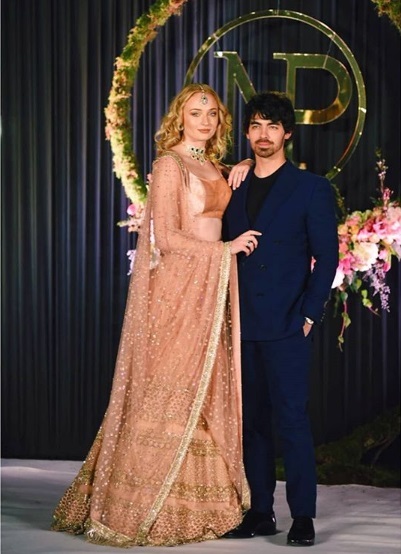 After wearing a red lehenga at Priyanka’s sangeet night, Sophie Turner turned into desi girl at Priyanka – Nick’s Delhi reception. 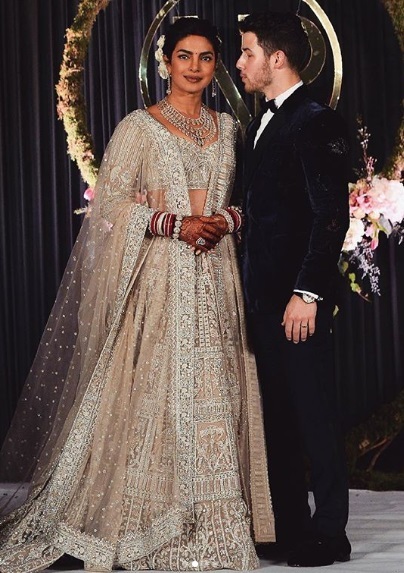 She wore a rose gold Sabyasachi lehenga and accessorized it with maang tikka and choker necklace. She made an entry with her singer fiance Joe Jonas who was seen in semi-formal suit. 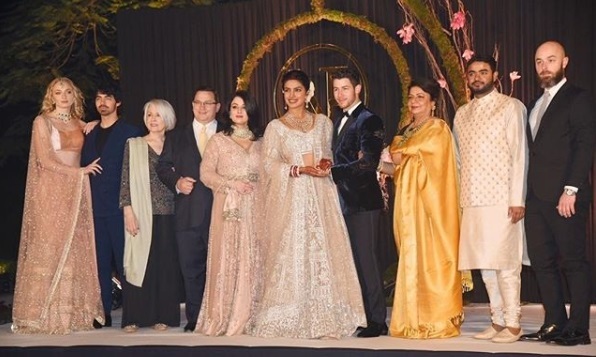 Madhu Chopra, Siddharth Chopra, Papa Jonas and Mama Jonas posed with Priyanka and Nick at the capital reception. 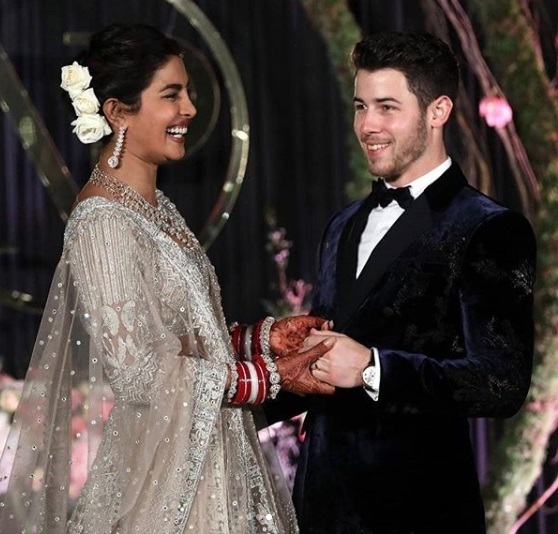 Subscribe with Eventznu and Follow us on Facebook as more pictures and videos from#Nickyanka’s grand wedding will roll on.